Description: ZEV Technologies Stainless steel slides are designed to improve accuracy and performance. They are manufactured in our state-of-the-art manufacturering facility. - ZEV's slides are machined from a single billet of 17-4 stainless steel to tighter tolerances than factory slides for increased consistency in barrel lockup which improves accuracy. - ZEV slides weigh less than factory slides therefore reduce reciprocating weight which reduces fatigue and allows for faster shot follow-up placement. - All ZEV slides have our patented optic cut which features posts allowing for more thread area keeping your optic securely mounted for your slide. - Offered in Flat Dark Earth (FDE) and Black Diamond-Like Carbon (DLC) your Enhanced SOCOM slide has been designed with performance in mind. The Enhanced SOCOM was originally designed for military and LE use to provide enhanced grip for tactical situations. The serrations on the design are extra aggressive to allow for racking on surfaces one handed. Designed to carry over to the top of the slide the SOCOM design provides for additional surface area for working with gloves or for racking on various surfaces. - Machined from 17-4 Stainless Steel Billet - Lowered ejection port to aid in ejection of brass - Match grade precision milled tolerances that are tighter than factory - Improved accuracy and grouping performance upon installation - DLC or PVD coatings offered have a rockwell hardness rating above that of factory coatings - RMR Adapter plate included (RMR Model only). 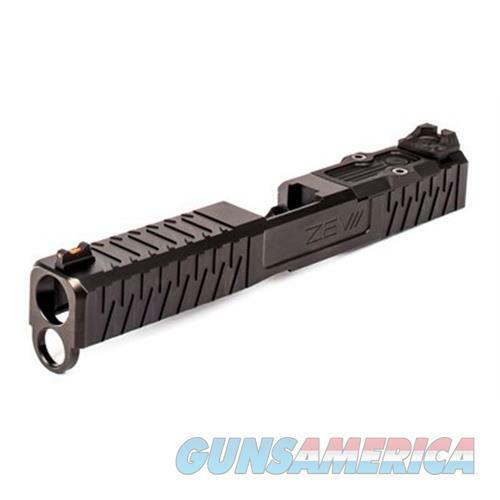 ADAP-RMR-SS-45-BLNK-SM - G19 Width 1.0 Height 0.84 Length 6.75 at 11.5 oz.